Using flow cytometry, we measured the nuclear DNA contents of all known taxa in Hepatica. 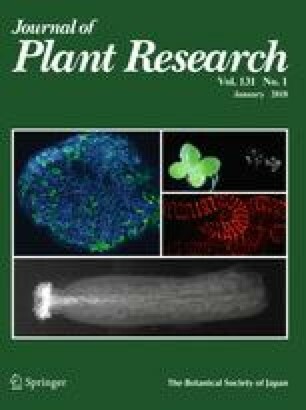 Nuclear DNA content of Hepatica falconeri (diploid, crenate leaf lobes) was significantly lower than that of diploid entire species. Among the tetraploid species, crenate species had lower DNA contents than the entire taxon H. nobilis var. pubescens. The DNA content of the tetraploid species was more than double that of the diploid species among the same leaf-type groups. The authors would like to thank Kei-ichiro Mishiba of Iwate Bio-technology Research Center for the useful information; Kozo Nishikawa and Yoshihiko Furuta of Gifu University, and Katsumi Kataoka of Tamagawa University for their help with the statistical analysis. We also thank the following people for supplying the materials: Mikinori Ogisu (Hepatica henryi and H. yamatutai), Koichi Iwafuchi (H. nobilis from Spain), Tokio Naito (H. transsilvanica), and Kyohei Matsuda (H. nobilis from Switzerland).